When I first wrote the manuscript for The Rogue Retrieval, I was a team of one. I wrote the book at my own pace, with no deadlines other than the somewhat-arbitrary ones I set for myself. I didn’t have anyone to go to for feedback, either. There’s a lot of freedom that comes with writing a book on spec. If I failed, no one would ever know. I didn’t have that luxury with book number two. Instead, I had critique partners, an agent, an editor, and maybe even a few fans. I still had to write the book, but when I was done, I knew that members of my “team” were going to read it. That raised the mental stakes: when I finished a scene or chapter, I wondered whether or not it was good enough to live up to expectation. The ugly centipede of self-doubt can be crippling for any writer. Fortunately, the simple fact that people were expecting that next manuscript created enough urgency to keep me going. Centipedes be damned. Every writer has strengths and weaknesses. Some of us write slow openings, but killer endings. Some of us are great with narration but struggle with dialogue. Over time, you learn your particular weak points and try to give them more attention. For me, plot-wise, the middle is the hardest part. That gets complicated for book #2 in a planned trilogy, because the ENTIRE BOOK is a kind of middle. How much do you give away? How much do you hold back? I asked myself these questions over and over. The good news was that, thanks to item #1 above, I had people around to point out my weaknesses. My editor (David Pomerico) is very good at finding them, and steering me in the right direction. Also, because he’d read my outline for the whole series, he knew when I was trying to hide things that I shouldn’t. The lesson here is that you should find people who know your weak points. Listen to them and pray they don’t sell you out to your enemies. As I wrote in my previous guest post for Terribleminds, copy editors can do wonders for taking you down a peg. Having learned many grammar and punctuation lessons embedded in my 1,500 copy edits for The Rogue Retrieval, I felt all but certain I’d do a much better job this time. Many of the corrections addressed minor formatting issues I could preemptively fix before the editors ever saw it. That should make for a much easier copy edit, right? Sort of. 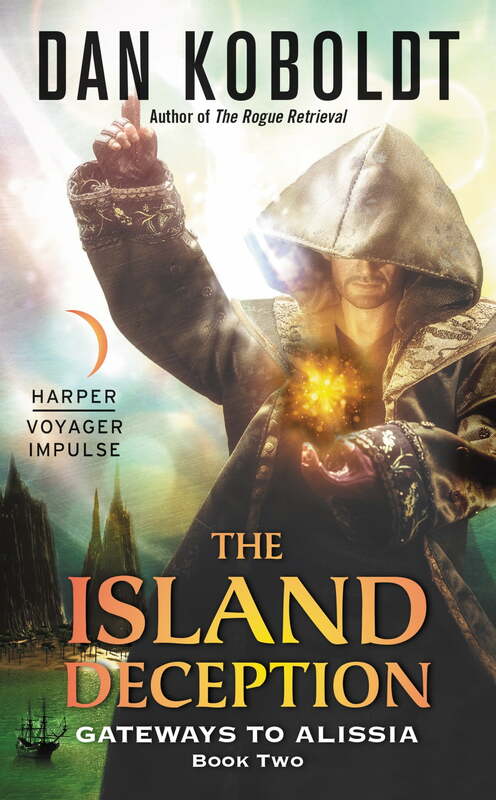 The manuscript for The Island Deception came back with 1,200 copy edits. In some cases, I tried to fix a formatting issue but only made it worse. But most of the copy edits were punctuation-related. A lot of my commas get moved around, but the hyphen/em-dash is my absolute bane. At this point, I feel like I’ll never learn it fully. That’s why we have copy editors. My main character is a Vegas illusionist, someone who deceives people for a living. In the first book, I enjoyed putting that skill set to work. With book two, I wanted to take it up a notch. The word deception is right there in the title. So I made my MC lie and cheat like his life depended on it, which did. What surprised me about writing that was how much I enjoyed myself doing it. We penmonkeys are all liars to a certain extent. And we often put a little bit of ourselves into our characters. Mine is charming, persuasive, and willing to put in the work to excel at his job. He’s the guy I sometimes wish I could be. That makes writing him a hell of a lot of fun. By the time I sent off the manuscript to my editor, I felt like it was in good shape. It had passed through the gauntlets of two critique partners; even my agent called it “pretty clean” (coming from a literary agent, this is a compliment). Imagine my surprise when I got a seven-page edit letter. My editor said look, if you give this a light polish it’ll be a good book. But if you’re willing to dig deep and put in some hard work, I think it could be great. Those edits took two and a half weeks of round-the-clock work. By the time they were done, I had ants crawling out of my eye sockets and wanted to set fire to the world. But I’d put in the work, and the book was better for it. I figure it puts me one step closer to the character I’d like to be. Thanks for hosting me, Chuck! I hope your readers enjoyed it. Dan thanks for sharing and the post. Always nice to hear about different experiences from published authors. I identify with you2 second item. I have slow openings but I make up for that by being really exceptional at creating poor dialogue. Cheers! Ah, editors. You can spend months on a single manuscript self-editing, and you’ll still get back a rap sheet of mistakes a mile long. The good news is that they can make our writing so much better if we’re willing to listen. Thanks for the post, Dan! Kudos for not letting the centipedes eat you alive. I’m a bit surprised you didn’t put links for either of your titled works. The Rogues Retrieval is the first work, yes?